The Avocent SwitchView PS/2 KVM (4SVP10-001) desktop switches are a perfect buy for small offices and home offices. This affordable KVM switch adds both control and flexibility to your desktop. 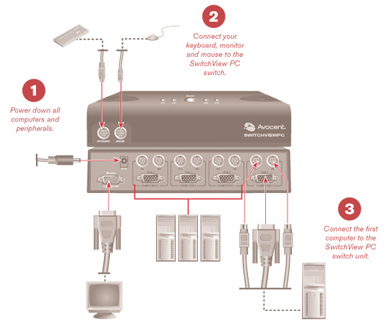 The Avocent SwitchView PS/2 KVM (4SVP10-001) switch lets you control two PS/2 computers from one keyboard, monitor and mouse --- adding valuable desktop space for other peripherals. Lighted LED indicates which computer you are accessing and audible indicators confirm channel switching. With color-coded cables for easy installation, customizable channel selections and error free boot up, the Avocent SwitchView PS/2 KVM (4SVP10-001) switch offers you the most complete desktop KVM features at the industry's most affordable price. Power Frequency Input 9V DC @1A external transformer (adaptor is optional) normally power is drawn from the PC PS/2 port. Question: I have an Avocent SwitchViewPc model 4SVP10 with PS / 2 inputs ... I don't have any more keyboards and mice with such attachments, if I build or find an adapter on the market of PS / 2 to Usb ... all this could work? You should be able to use a PS2 / USB adapter such as the KMU2P PS2 to USB adapter to use a USB keyboard with your KVM model. That being said, depending on the application and adapter, sometimes USB / PS2 conversion may case issues, so we can't really guarantee results of this combination. Alternatively, for a similar KVM switch that would natively support PS2 (and USB) sources but USB keyboard & mouse, you could get the Aten CS1754 KVM with 2L5302P MasterView PS/2 KVM Cables. Please feel free to reach out to you KVM Switches Online sales representative for a quote, or if there is anything else we can help you with!